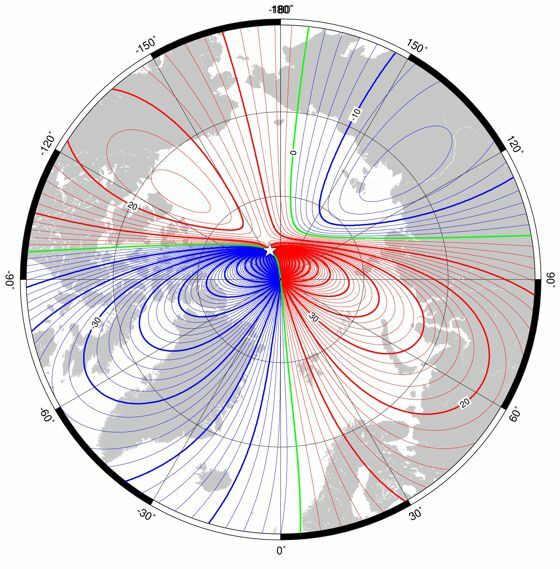 Declination (magnetic variation) in region of north pole at 2015.0 from the World Magnetic Model . Red - positive (east), blue - negative (west), black - zero. Contour interval is 5°. (Click to enlarge). The shape and strength of the Earth's main magnetic field is not simple nor easy to describe exactly. It has a complex form which changes continuously over time. Geophysicists have to rely on mathematical models to compute the strength and direction at any point on or above the surface. Given that the field changes continuously, we must also forecast how the field changes with time. At BGS we produce a series of main field models for both practical and scientific purposes. Each of the main field models listed below (WMM, IGRF, BGGM and MEME) describes the magnetic field to a different level of accuracy or uses different data selection techniques to build the model. Further research is on-going to improve our ability to forecast the change of the magnetic field (known as secular variation) over time and to use new mathematical techniques to improve the main field models (such as data assimilation). These pages describe scientific and technical details of our modelling and research.